As we mature in the faith, we all long to know God more intimately through His word and prayer. But for many, prayer can be intimidating and even confusing. Sometimes we may wonder if God truly hears the cries of His children. Is God really listening and acting on behalf of His bride, even today? I’ve found when I’m at a standstill in my prayer life or am experiencing insecurity, a good, theologically sound book can encourage my heart, strengthen my faith, and motivate me to press on. The 10 books on prayer below are ones that have helped me during seasons of dryness. I hope they will help you decipher God’s word about the subject of prayer and invite you to draw near to Him in the process. Many modern day believers experience a lackluster prayer life. If you need to rekindle a fire for prayer, this book will do it. 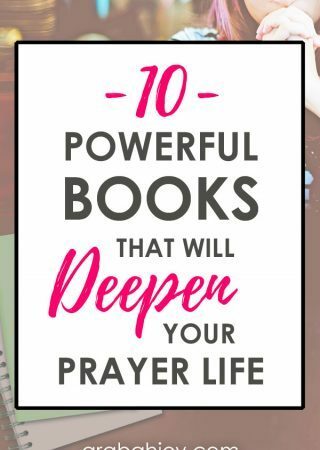 You’ll walk away from this book with a hunger for more fellowship with God and a biblical foundation for a deeper and more intimate prayer life. With evil and the schemes of the devil lurking around every corner, E.M. Bounds calls for believers to stand firm in God’s word. He invites Christians to thwart the plans of the evil one by clinging to their spiritual lifeline- prayer. Also, he equips believers to have direct fellowship with God, to impact their life with prayer, and to overcome Satan’s stronghold. This is a powerful, must-read for all Christians! Can one man or woman truly change the world? This story outlines how a humble man’s faith and prayer changed the outcome of WWII. The biography of Reese Howells will encourage you to draw near to God through prayer and remind you that the prayers of a single man can move mountains and impact the world for Christ. Ladies, this book is an excellent resource to create specific and personalized prayer strategies. These powerful strategies will empower you to fight against the forces of evil and stand strong. You’ll experience a renewed passion for prayer as well as practical ways to stand firm on His promises through prayer. Through this teaching, Murray invites Christians to the inner circle of Christ’s disciples for a deeper look on prayer. Through Jesus’ ultimate example of a fervent prayer life, he ignites a passion for God that will only be quenched through prayer. Connect with God in prayer through powerful and practical ways. Using a collection of prayer prompts and Scripture, Batterson inspires Christians to pray with boldness and confidence before the Lord. You’ll also experience the miracles God worked in the lives of prayer warriors around the world. In this powerful book, Keller explores the many facets of prayer. He instructs believers to make prayers personal and powerful. His instruction also includes specific topical prayers for everyday life, including grief, loss, love, and forgiveness. Plus, he’ll show you how to make prayer a cornerstone and an integral part of your day. A great resource! If life feels broken and unsure, Miller teaches you to piece the broken pieces together through purposeful prayer. Through daily fellowship with God, our relationship with God will bloom and we will begin to understand Him more. This gem offers practical insights for families, too. Do you regularly abide in Christ? Here, Murray reminds Christians of the importance of abiding in Christ and how it will impact your prayer life in many aspects. He attributes the Trinity and abiding in Christ to a powerful prayer life. In this book, Charles Stanley combines over 55 years of ministerial study and teaching. He encourages believers to fight the battles of life on their knees through constant fellowship with God. You’ll experience topics such as finding peace and joy through communication with the Lord, praying through life’s struggles and sorrows, and learning to recognize the voice of the Father. Using these classics as a guide, learn to draw nearer to the Lord and experience Him anew through prayer. 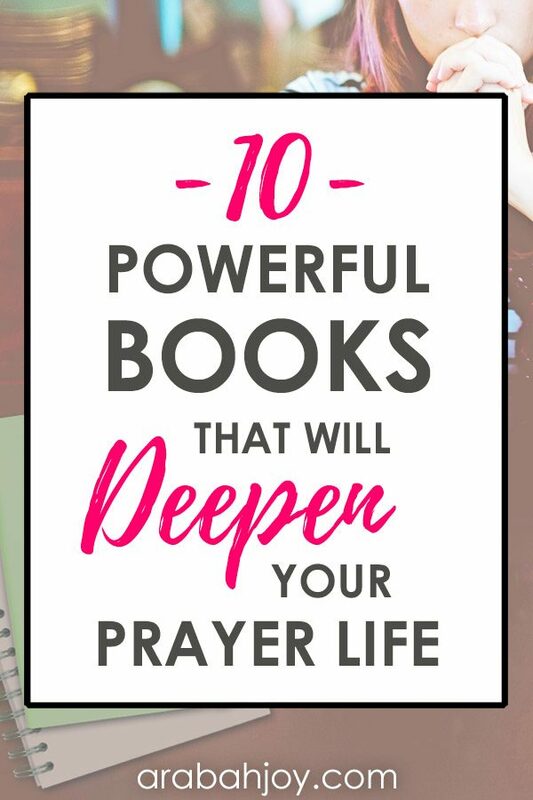 If you’re searching for a fresh insight on connecting with God, let these books take you deeper and refresh your prayer life like never before! What are your favorite resources for prayer? Which of these have you read and enjoyed? Thanks for this. I think I want to pick up Priscilla Shirer’s book based on this review. I loved these prayer resources. One book I like a lot but read it a long time ago was by Sheila Walsh, “Get Off Your Knees and Pray.” Loved the book Fervent.